Home » Opossum vs. Possum: What’s the Difference? Today, I want to talk about the opossum. Or it is possum? Opossum vs. possum: is there a difference? In this post, I will walk you through these spellings (opossum or possum) and outline when it is correct to use them. What is the Difference Between and Opossum and Possum? While it’s common for people to use these two spellings interchangeably, opossum and possum actually refer to different animal groups. In most casual writing this won’t make a difference, as it’s commonly understood that most writers mean opossum when they write possum. And since opossums and possums are both members of the marsupial family, your reader will generally understand what you mean. But it is important in scientific and technical contexts to know the difference because, after all, these are different animal groups. So, let’s get started. Should you use possum or opossum? The opossum (pronounced ə-pos-em) is a North American marsupial with a white face and grayish-white body. As I said above, the Virginia opossum generally has a white face with a grayish-white body, with black ears and feet. Their fur is coarse. The opossum has sharp teeth like a cat, but the primary distinguishing feature of an opossum is its bare, rat-like tail. All things considered, the opossum is generally considered an ugly, scary looking creature that people are not enthused to see in their backyard or trashcan. The possum (pronounced pos-em) is an Australian marsupial with four primary color variations: silver-gray, brown, black, and gold. It’s true that both the opossum and possum are marsupials, but the similarities stop there for the most part. The Australian possum, also called the common brushtail possum, looks a lot more like a large Chinchilla than an opossum to me. First, its coloration is much different. They range from a chinchilla gray to a fox silver-gray and gold, and even black. The ears of a possum are larger than that of the Virginia opossum, and their fur is softer and much more bushy. The key differentiator, however, is the Australian possum has a bushy tail covered in fur (hence the name). Both animals are marsupials, and their snouts, feet, and eyes are similar. They both have similar diets, essentially being opportunistic omnivores. Opossums and possums both eat, to varying degrees, meat and other animal matter such as insects, birds’ eggs, and small vertebrates, leaves, flowers, shoots, fruits, and seeds. 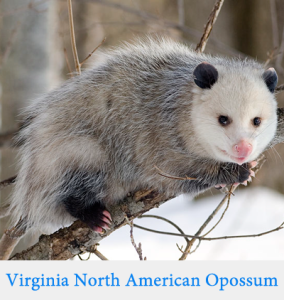 I’m not a scientist, but upon seeing the common brushtail possum, I would not immediately think of the Virginia opossum. The popular phrase to play possum or playing possum is a reference to a defensive mechanism employed by opossums where they play dead or pretend to be asleep when threatened. This phrase is spelled playing possum, not playing opossum. Are Opossum and Possum Interchangeable? The spellings of these words are not interchangeable; as we learned above, opossums and possums are different animal groups in vastly different regions of the world. In North America, however, it is common to see possum written when the writer actually means opossum. In fact, Garner’s Modern American Usage states that possum is more than twice as common in print than is opossum and even more common in speech. In informal or nonscientific writing this mistake might not make much of a difference, but the writer should always keep his audience in mind when using these words. Readers in the United States might not flinch when they read possum to mean opossum, but an Australian reader might be confused by reading opossum in reference to a possum. Sometimes writers will misspell opossum as opposum or oppossum. This mistake has arisen doubtless from the influence of the word opposite. Opossum is the correct spelling. Opposum is an incorrect spelling. Oppossum is an incorrect spelling. Is it possum or opossum? Well, that depends on the animal type to which you are referring. While it’s not widely known, there is a difference between possum vs. opossum. Opossums are marsupials living in North America. 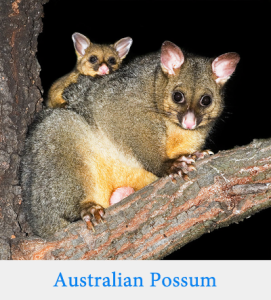 Possums are marsupials living in Australia and its surrounding islands. 1 What is the Difference Between and Opossum and Possum? 7 Are Opossum and Possum Interchangeable?